It was September 27th, 1997. I was aged just eight years old but I remember it like it was yesterday; the sun was shining, the birds were singing and all that rubbish. Indeed, the most significant events of the afternoon were left to my imagination as I sat in our back garden listening to the radio in my replica kit. Tickets for the game were nigh-on impossible to come by; my dad had queued for hours outside the Leeds United club shop in Wakefield city centre but still didn’t manage to secure any. For us, it was undoubtedly the biggest game of the season: our home tie against Manchester United. More often than not we’d struggled against Alex Ferguson’s men, and it was a humiliating 4-0 defeat during the previous campaign that had led to Howard Wilkinson losing his job as manager. Unfortunately, victories in the Roses Derby for the lads in white were few and far between. So when Gary Kelly’s floating free-kick was met with the head of humble centre-half David Wetherall, you can imagine the excitement that ensued. Peter Schmeichel was unable to reach the ball and I was unable to contain my excitement. Our next door neighbour ran outside to see if I’d been hurt. Our dog galloped around the living room as my dad leapt-up from his seat. Wetherall’s goal in the 34th minute was the only goal in the game, and so it finished: Leeds 1, Manchester United 0. Coasters around the house fell victim to felt-tip fuelled graffiti, with a combination of the aforementioned score-line as well as the simple declaration of “Wetherall Is God” in my neatest hand-writing. I wanted to gel my hair like David Wetherall’s. I rolled my school jumper’s sleeves up in the same way that he’d roll his shirt on match-days. For that spell of my life, the Sheffield-born scientist was simply untouchable. 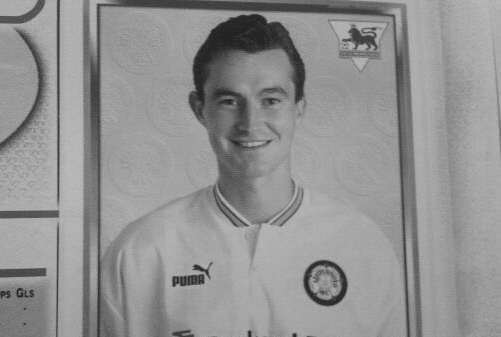 Disaster struck when I met him at Leeds United’s club store in Wakefield and he signed my A5 photograph “Dear Mathew…” instead of “Dear Matthew”, but the tears were soon forgotten when my dad played our well-used VHS of Leeds United’s season review for 1997/98. Fifteen years later, I still hold a lot of respect for David Wetherall. He left my beloved Leeds United after David O’Leary chose to have Lucas Radebe and Jonathan Woodgate at the heart of his defence: a partnership that nobody could feel ashamed to lose-out to. Spending over a decade at West Yorkshire neighbours Bradford City, he is now Head of Youth Development at the Football League. It pleases me to know that we do indeed have something in common; Wetherall was inducted into Show Racism The Red Card’s Hall of Fame in 1997, whereas I’ve worked closely with Love Music Hate Racism for the last four years. Wetherall embodies everything that the modern expectations of a footballer sadly miss; a modest, loyal and hard-working family man. He’d probably blush and dismiss this, but I think that he’s a true legend. – Matt Abbott is the frontman and lyricist of Wakefield-based band, Skint & Demoralised.